Getting a cart the right size for your pony is extremely important. If a cart is too big, the pony could be injured. If a cart is too small, it will be an uncomfortable ride for pony and driver. The weight of the cart is just as important as the size. A light cart might not grip the road and could topple over. A heavy cart will hurt the pony's back. If in doubt, seek professional advice before you go out on a public road. Measure your pony on a level ground. Measure from the ground in a straight line up the pony's withers. Convert the measurement to hands. Write down the measurement in centimeters and hands. Ten centimeters equals one hand in horse measurements. Measure the pony from the ground to just below the muscular section of the hindquarters. Write down the measurement in centimeters and hands. Measure the cart from the ground to the shafts. The cart should be in driving position. Work out if the shafts are the same height as the bottom of the pony's hindquarters. Weigh or find out the weight of the cart and the pony. 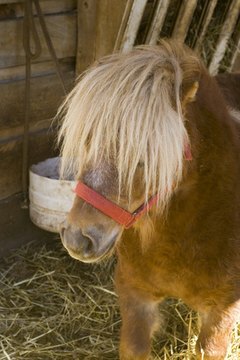 A pony can pull twice its own weight, including the driver. Tell the vendor the exact measurements of the pony and the weight of the driver, if you're buying a cart online or over the phone. Check the measurements of the pony and the cart according to the chart below. All measurements are in hands. Roxy Freeman has been writing professionally since 2006. She has written for "The Guardian," "The Daily Mail" and "YOU." She also works as a ghostwriter for authors. Freeman holds a National Certificate Training Journalists award from Brighton Journalist Works and a Bachelor of Arts in European politics from The Open University. What Is a Good Horse Saddle for a Big Person?